A former regional journalist has been elected as a councillor in the county he used to cover. Anthony Bush, left, who worked on the Exeter Express & Echo and Western Morning News, is now sitting on Mid Devon District Council. 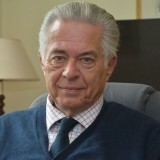 Anthony, a Conservative, also had stints with the Western Daily Press and the Bath Chronicle before joining the Press Association. The 69-year-old was also a magistrate for 18 years, 16 of which were spent as chairman of the Bench, and has also sat on Tiverton Town Council. Of his election to the district council, he told Devon Live: “I set myself a target to knock on doors and to meet as many people as possible, and I was taken aback at how exceedingly gracious people were – I had expected some to slam their door in my face for turning up out of the blue, but that never happened. “As for politics, I didn’t discuss that at all, nobody even mentioned it or the word Brexit, but people are either with you are they aren’t. It’s no point arguing on the doorstep as you’re never going to convert anyone having a chat in the middle of their tea. I tried to do it in a rather jolly way. “I have devised a method to deal with the queries, keeping things logged, marking the date and following things up to see if they have been resolved. I can’t believe how different it all is, from recycling, parking, speeding, people concerned about the flats that they live in and complaints about agricultural machinery using the roads. No disrespect to Mr Bush, but this story is so thin that I can read the previous web page through this one.